Alchemie Animator By Alchemie, LLC is the latest creation from Julia Winter, CEO of Alchemie and the creator of the app Chairs. The free app is available in the itunes store and is currently designed for both iPhone and iPad. I was told a computer version is in the works. This past week, I had the opportunity to participate in a live animator workshop hosted by Julia and saw some of the amazing things that are being done with this app. Next, I decided to check out YouTube to see what else Julia was doing with this app and what others were doing as well before I started brainstorming how else could I use this in my classroom. In the first video I saw by Julia entitled Methane Combustion, the animation looks at the combustion of methane to produce carbon dioxide and water. showing 2 CH4 + 5O2 --> ? CO2 + ? H2O Since the ratio between the reactants is no longer 1:2 then something will be in excess. If you have been following some of the recent ChemEd X publications, you know a recent article, Using Visual BCA Tables to Teach Limiting Reactants by Melissa Hemling | Wed, 04/26/2017 mentions limiting reactants. Whether you calculate theoretical yield or the amount of excess reactant remaining is up to you. The topic of determining the limiting reactant and discussing why there may be some of both reactants remaining after the completion of the reaction is meaningful. Using the Alchemie animator may be an additional tool for helping your students build conceptual understanding. I myself have tested limiting reactants using particulate level drawings. This is another way to explain and show the topic of limiting reactants by allowing the students to move, manipulate, and then build the products of this methane reaction and discover for themselves what the actual yield is and what reactant is limiting and what is in excess. I have done this with my board magnets but now this allows every one of my students with the use of an iPad to do it themsleves. resulting in 2 CO2 + 4 H2O being produced with a single O2 in excess and the two CH4 's as the limiting reactant. If your students need another non-chemistry understanding then this clip is a favorite of mine from the movie Father of the Bride. See if you can figure out the correct combination for the superfluous buns and what is the correct ratio! Next, in a previous post of my own, Building Molar Mass, 05/10/2015, I mentioned my use of different colored cubes to correctly build chemical formulas and then from that determine the substance's molar mass. I could see how the Alchemie app would be a great alternative instead of using the blocks. Similar to the blocks, the app allows for atoms to be different colors. Fifty two different colors to chose from to be exact. An advantage to the blocks is that with the text editor in the app a student can add in the chemical symbol on top of the circle and for an additional advantage they can add in the charges that are associated with each of the substances. Note: substances shown are those other than aluminum sulfate and later titles were added using text editing software. 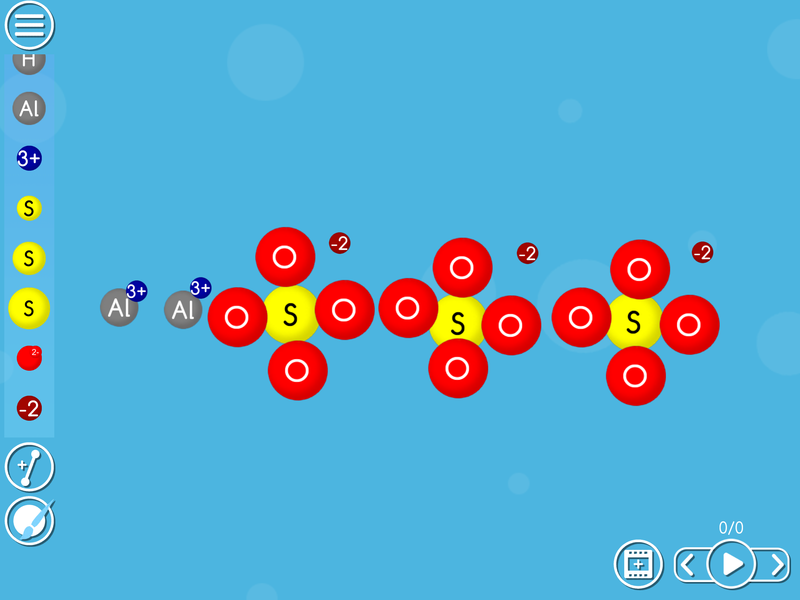 Again with the capability of adding in charges then oxidation and reduction reactions and assigning oxidation numbers to individual atoms can now easily be done with this app. There is even a built in template for building electrochemical cells. 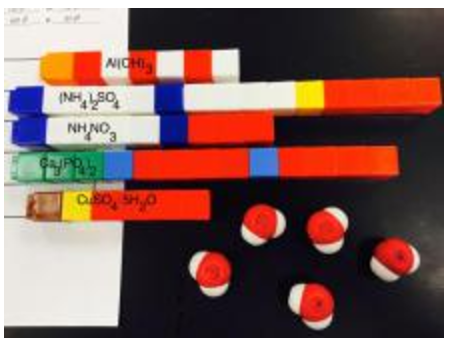 Now note that this application didn't require any animation but simply using the app to have the students build each of the chemical substances. Not that I would stop them, but the more advanced and familiar they become with the app then the more challenges you can introduce to them. Also, a nice feature with the app is that all work can be saved into files. Another nice feature is that the atoms can be made different sizes so if you wish to stress the size of metals versus the nonmetals or what happens to the size of an atom when it loses or gains electrons could easily be animated. Again, I have shown the diagrams to my students in the past regarding the size of an atom compared to its parent atom, but my feeling is that by building them and then adding animation allowing students to watch the sulfur atom become larger as it gains two electrons would be better than just seeing it via a diagram. Well, that's enough brainstorming for now. Other videos located on the Alchemie site include Boyles Law, an Aldol reaction, and even an electrochemical animation. Also, be sure to check out this video showing an example of the dissolving of table salt with Brittland DeKorver and other commentary by Michael Seery. Thanks, Doug! It is great to see new uses of our app. We are doing a few more online workshops. W, 5/10 at 7:15am ET, M, 5/15 at 7:15am ET, and W, 5/17 and 4:15 pm ET. Here's the calendar link to join us! We will also be at ChemEd in South Dakota. Reach out if you have any questions/comments. Look forward to brainstorming more in South Dakota!